Could I take down a T. rex with my Beretta 9mm pistol? At a meta level, the research department was impressed with your question, Jeramie. What with tsunamis, tornadoes, and looming sovereign debt default, Little Ed observed, the past year has taught us to be ready for anything. Sure, meeting up with a T. rex on the bike path ranks low on the likely-crisis list. However, the risk associated with box cutters was historically underestimated, too. Maybe so, Una riposted, but this guy is still a walking meat snack. Seriously, taking out a T. rex with a 9mm pistol? You might as well try it with an ice pick. Even with a 12-gauge shotgun you'd be taking a chance. What you want is a rifle, the weapon of choice for really big game. Lions, cape buffalo, rhinos, hippos, and elephants have been successfully bagged with rifles for more than a century. Handgun aficionados will make bold claims for the .44 magnum revolver, and I've heard that poachers in central Africa fabricate 12-gauge "elephant guns" — rudimentary homemade shotguns loaded with double-power shells bearing solid lead slugs. These are said to be effective but only at close range. Call me timid, but if I'm facing off against T. rex, I want a lot of room. Why stop at rifles? interjected Little Ed. Why not bazookas, or rocket-propelled grenades? Now Ed, Una remonstrated. The hallmark of the Straight Dope is practicality. Notwithstanding the need for T. rex preparedness, one doesn't want to alarm the populace. Even in Texas, if you're walking around with a Schwarzenegger-style six-barrel minigun, people are going to look askance. Still, the question remains what type of rifle would be best. Science fiction offers only rough guidelines. In L. Sprague de Camp's "A Gun for Dinosaur" (1956), a group of time-traveling hunters brings along a Continental .600, a Holland & Holland .500, and a Winchester loaded with .375 Magnum shells, the last of which proves crucially inadequate against a T. rex. Ray Bradbury's "A Sound of Thunder" (1952), about a similar expedition, specifies only the use of rifles and steel bullets. In the cheesy 1977 film The Last Dinosaur an ordinary hunting rifle is employed. This will never do. 1. In view of the giant reptile's speed, agility, and aggressiveness, chances are you'll get only one shot. 2. Crippling a T. rex, even if you're skillful enough to hit its fast-moving legs, is difficult due to its thick bones. So you need to shoot to kill. 3. The critter has a massive skull clad in dense muscle protecting a relatively small brain case, making a head shot pretty tough. 4. Unfortunately, T. rex's heart is also well protected — your bullet must penetrate three or four inches of skin and abdominal bone, then travel several feet through more dense muscle to reach the vitals. You'll need more than a BB gun for this. Based on his study of bullet geometry, penetration, and stopping power, Templar has developed a metric for ammunition effectiveness he calls "Terminal Medicine," abbreviated "T.Rx." 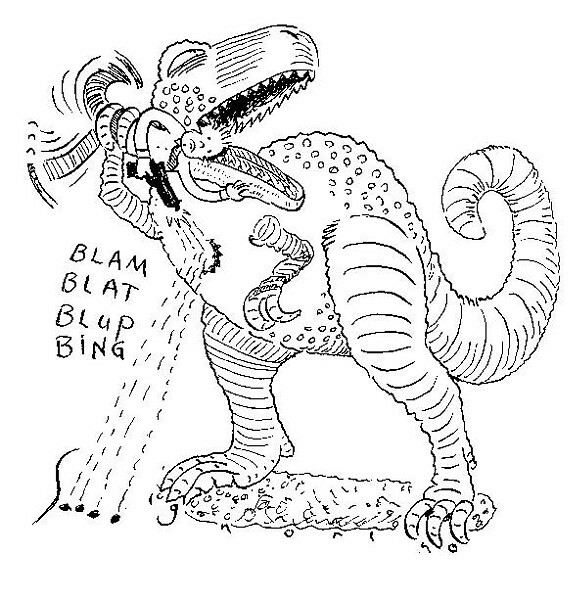 To reliably kill an adult tyrannosaurus, he asserts, your ammo must have a T.Rx value of at least 93. If you think the animal might be in heavy bush, wounded, or otherwise pissed off, you may need something with a T.Rx value of 106 or more. Templar's top-rated cartridge is a 4-bore Nitro, a bratwurst-sized round with a T.Rx score of 362 that looks like it'd punch through a brick wall. If you'd rather not have the recoil dislocate your shoulder, you can get by with the venerable .460 Weatherby, number 32 on his list, which posts a respectable 113. Ed meanwhile was perusing rexGun on a Kindle. Una, he said, this fellow Templar soberly describes an encounter with a living T. rex as though it actually happened. I can't tell if this book is a put-on or the product of a disordered mind. Either way it doesn't seem like the best source of scientific information. Besides, how much can we really know about this beast, given that it's been extinct for 65 million years? Despite its intimidating appearance, it may have had the disposition of a pussycat. Sort of like Rahm, only reversed. Ed, Una said, try not to be a conspicuous ignoramus. I acknowledge Templar's book involves ample guessing and supposition. But if we removed these weapons from the analytical arsenal, half the Straight Dope archive would be blank. All I can say is his results look plausible. If you'd rather trust to spitballs, lawn darts, or a 9mm Beretta, that's up to you.